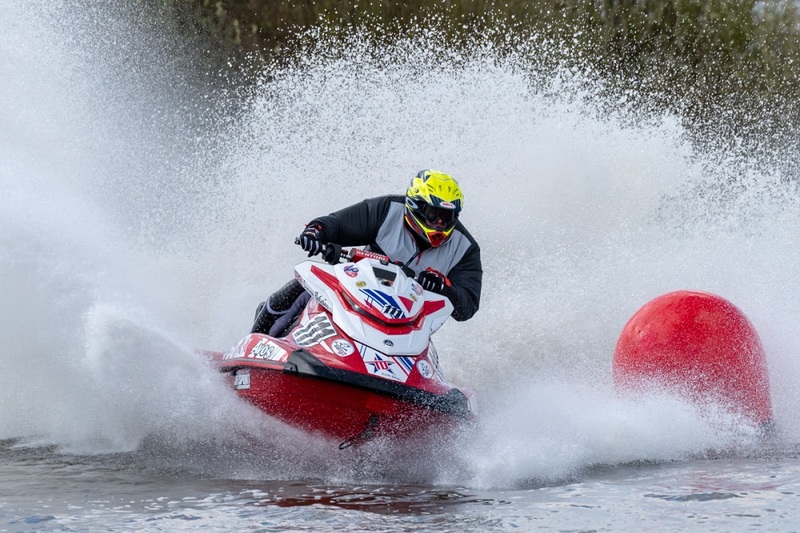 Deans Team Yamaha rider Simon Belcher made an outstanding start to the British Jet Sport Championship season at Kingsbury Water Park over the weekend, 6th/7th April, to depart the West Midlands venue leading the Stock Class standings and finishing second in the Modified Class. Swindon-based Belcher, who will be back in action this coming weekend in Europe for the opening round of the Belgian championship, headed into the British curtain-raiser determined to make the strongest start possible and he certainly achieved his aim. Starring in the Stock class aboard his Yamaha GP1800, Belcher claimed three race victories to finish first overall. Also entering his Stock boat in the Modified class, he produced some giant-killing rides against more powerful machinery to take two runner-up spots and a third to finish second overall. “It was a great first weekend on my Pro Stock Yamaha GP1800, Deans Team and Team AVOS did a great job giving me the boat to win”, said an elated Belcher who, away from the water, heads up touring car motorsport team HMS Racing, “I wasn’t intending to ride in the Modified class, as I only have a Pro Stock boat, but I’m glad I did as it was great practice against highly modified machines. After rolling back the years to win the European Jet Sport Championship crown last season, 18 years after his last, Belcher undoubtedly has his sights set on more titles in 2019 and particularly after such an eye-catching start to the British season this past weekend. Support this year comes from key backers Th1rst Drinks, AVOS Watersports Den, Yamaha Marine UK, Yamalube, Deans Team Factory Racing, VP Fuels, ZX1, Finch Signs, HMS Racing, Retrojet, MRC, TSE, BNJ Parts, Quakysense, Jet Trim and Pro Green MX. Belcher now gets ready to head to Ranst in Belgium for the opening round of the country’s domestic Jet Sport Championship this coming Sunday, 14th April. HMS Racing, meanwhile, will contest the opening event of the inaugural Dunlop Touring Car Trophy season just over a month from now on Saturday, 11th May, at Oulton Park in Cheshire.